LiveU cellular uplink- Olympic Games. 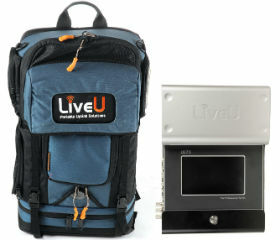 Hackensack, NJ, July 24th, 2012 – LiveU (www.liveu.tv), the pioneer of portable video-over-cellular solutions, has announced that over 100 units will be used to provide enhanced live video coverage of the 2012 London Olympic Games. Customers who will be using LiveU’s technology to increase the scope of their content, taking advantage of its innate mobility, include NBC, Globosat, Terra, TV Record, Televisa, Uno TV and BBC News. LiveU, along with its exclusive UK partner Garland Partners Limited, has further enhanced its technology for the Olympics using QoS SIM cards. The services, backed by the on-site support team, will enable LiveU customers to deliver the best broadcasting and online video experience. In addition, LiveU is using dedicated network resources, supplied by Broadnet Communications. LiveU’s pioneering uplink technology was deployed for the first time at the 2008 Beijing Olympics where NBC Universal used LiveU’s live mobile units to broadcast live from the Games – a landmark event for the company. Since then, LiveU has been covering the world’s top news and sporting events for hundreds of customers including tier-1 broadcasters, global news agencies and online media, notably the 2010 World Cup in South Africa, the annual Super Bowl and NBA Finals. Broadcasters and streaming companies alike will be taking advantage of the HD quality coverage they will be able to achieve using LiveU’s professional-grade backpack units. With sporting audiences demanding spectacular live coverage of all aspects of the Games, the flexibility, resiliency and mobility provided by LiveU’s uplink solutions will be key. LiveU’s LU70 is the industry standard for bonded 3G/4G LTE backpacks with proprietary RF technology for superior resiliency, up to 1080 HD video and sub-second latency for a satellite-like experience.